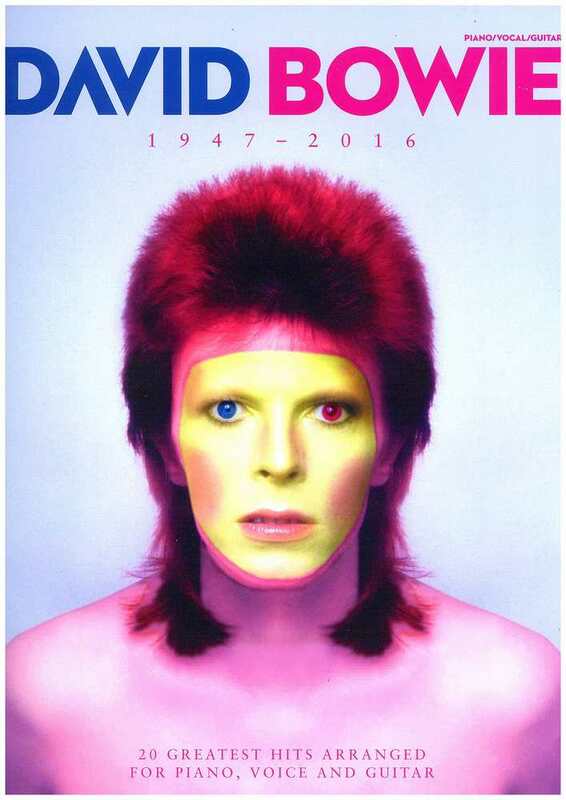 This commemorative songbook features 20 of David Bowie's greatest hits, spanning his entire career from 1969 to 2016. Each song is arranged for Piano, Vocal and Guitar, with full lyrics and Guitar chord boxes and symbols. 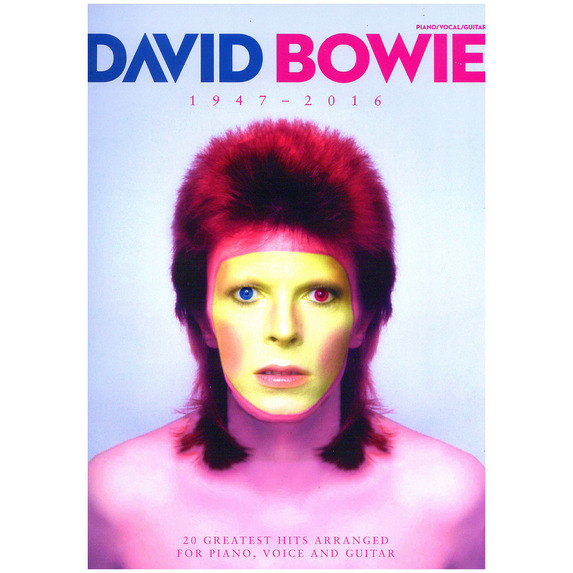 Learn to play David Bowie's timeless and beloved songs with this sheet music collection. David Bowie was an actor, a fashion icon, an artist, a mime and a writer, but above all, his creative output as a musician brought him the respect, admiration and adoration enjoyed by few other pop stars before or since. His consistent re-invention of his aesthetic, style and sound, as well as his mysterious alter egos enabled him to mould his music to a number of genres, eluding easy classification and producing a string of widely acclaimed albums and singles. This collection of David Bowie sheet music features 20 songs that represent a musical icon from his first single Space Oddity, to Lazarus, from his acclaimed final album 'Blackstar'. Other songs in the collection are consistent hits, every single one of them sure to be instantly-recognisable. 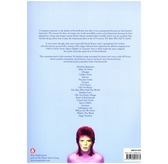 From Heroes to Changes and Jean Genie and from Life On Mars? to Let's Dance, these are just a few of the brilliant David Bowie songs you'll be able to play. 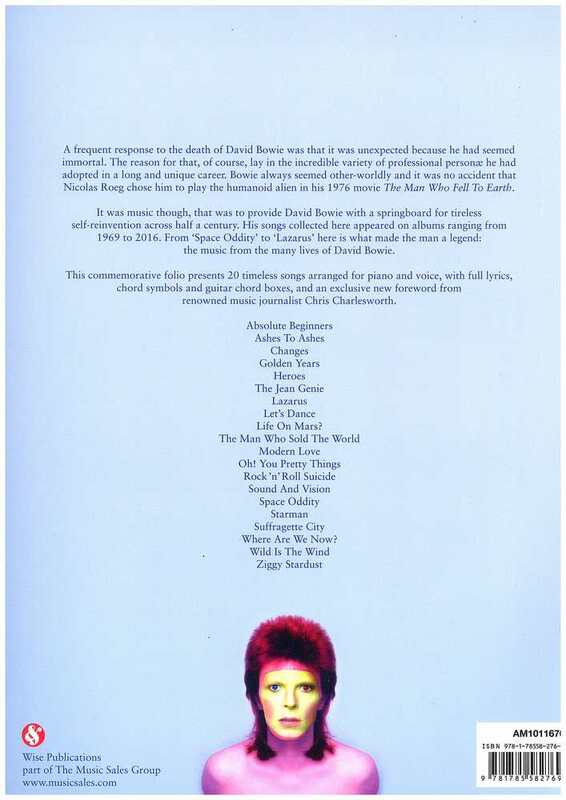 This songbook also features a lengthy introductory tribute from renowned music journalist Chris Charlesworth, making this a fitting collection for the casual player, as well as the huge Bowie fan looking to learn a selection of his greatest hits.